The eruption itself (video) is still ongoing, albeit possibly with a slight decrease in intensity according to the latest reports. However, the ash from the eruption has prompted the closure of the Keflavik Airport near Reykjavik, the largest airport in Iceland. You can see the newest London VAAC models for the ash from Grímsvötn - and you can also check out an informative post on the new(ish) blog Volcan0101 that discusses why this eruption won't be like Eyjafjallajökull in terms of wreaking havoc on the airspace over most of Europe. However, there is a chance that some ash might make it as far as the British Isles in a few days if the eruption continues as the ash spreads out over the North Atlantic (see image below, provided by Eruptions reader MRK). The MODIS imager did capture today (5/22) some shots of the tan ash towering over the local clouds as well, covering a larger portion of Iceland (see below). Thermal image of the ash plume from Grímsvötn seen over the North Atlantic on the night of May 21, 2011. Ash is likely as high as 16 km / 55,000 feet in this image. A MODIS image from May 22, 2011 of the ash from Grímsvötn swirling over Iceland. See original here. The Icelandic Meteorological Office did put up a post yesterday on the eruption (video), showing the dramatic onset of the eruption at around 5:30 PM (local time) - and sure enough, the plume* was over 20 km / 65,000 feet tall with abundant lightning (video). A flyover of the volcano this morning by Icelandic geologists found the crater vent to be 500-800 meters wide, which is relatively small although the eruption itself is one of the larger in Iceland in recent years according to Dr. Magnús Tumi Gudmundsson. The ash from the eruption is definitely falling around Iceland, with visibility down to ~50 meters (Icelandic) in some places (Icelandic). You can see some of evidence of this is the great before/after sequence form the Jökulsárlón webcam (submitted by Eruptions reader Kirby), showing the new grey layer of ash on the previously white ice and snow. Apparently there were people out on Vatnajökull yesterday when the eruption began and had to spend the night in a hut near the volcano as well. There are also a number of road closures (Icelandic) around the Vatnajökull area, likely in preparation for any potential jokulhlaups (floods) the eruption might generate - and people are being warned not to try and visit (Icelandic) this eruption. The view from the Jökulsárlón webcam before (top, taken at ~4 PM EST 5/21/11) and after (bottom, taken at ~9 AM EST 5/22/11). Note the new layer of dark grey ash in the lower image and the increased water flow as seen in the bottom of the lower image. I, again, will try to update this as new information emerges - and you should feel free to do the same. As usual, you can try to catch a glimpse on one of the Mila.is webcams, but the viewing isn't great right now (11:30 AM EST 5/22/11). However, you can see distal effects of the ash on other webcams. *And all you news media folks out there: IT IS NOT SMOKE. I don't know how many articles I've read where images of Grímsvötn are labeled as "spewing smoke". There is no smoke in the plume. None. Zero. Zilch. The plume is made of three things: (1) steam - a lot of it; (2) ash - fine, fragmental pieces of silicate glass, not stuff from your backyard BBQ (which is burned carbon); (3) volcanic gases like CO2, SO2, H2S and others. It is NOT SMOKE. "The eruption was preceded by intensive earthquake activity lasting for about 1 hour. An ‘ash-loaded’ eruption plume rose rapidly up to about 17 km height (estimated 55000 feet from ground based radar, overview flights, and pilot reports). Ash from the lower part of the eruption plume was deflected southwards and from a higher level towards the east. Few hours after the onset of the eruption ash fall began over wide area in the nearest populated areas south of the Vatnajökull ice cap, at a distance of more than 50 km from the eruption site." 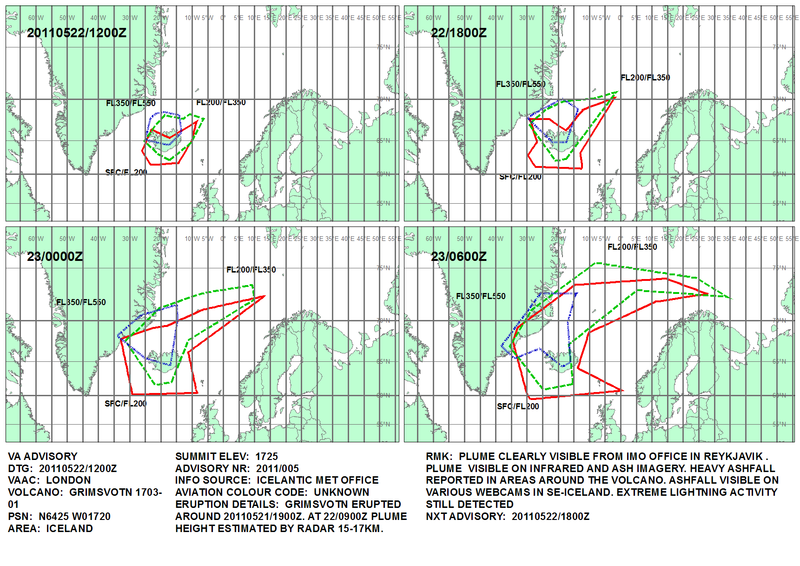 "Initial overview flight, with limited visibility, and earthquakes locations suggest an eruption site in the southwestern part of the Grímsvötn caldera. Ice cover there is relatively thin (50-200 m) and meltwater is anticipated to accumulate within the Grímsvötn caldera lake. From there, it may eventually drain in a sudden glacial outburst flood, jökulhlaup, along a subglacial channel and issue from the Skeiðarárjökull outlet glacier." Sounds like we should be expecting a flood at some point in the next few days. The IMO have also updated their page with a post about the abundant lightning in the Grímsvötn ash plume. It looks like the occurence of lightning in the plume was 1000x more frequent than during the eruption of Eyjafjallajökull last year. We also have some images of the sulfur dioxide plume over Iceland from the eruption via GOME and the ESA. UPDATE 3:00 PM (Eastern): This is the first report I've seen (Icelandic) that talks about the composition of the Grímsvötn ash. Dr. Freysteinn Sigmundsson says the ash appears to be basaltic in composition, which is typical for Grímsvötn and the ash is relatively low in fluorine, which is good for grazing livestock in Iceland. Fluorine, in high doses, can cause death to livestock through fluorosis and Iceland has had high fluorine eruptions (especially the 1783 Laki eruption) in its past that caused significant livestock deaths. The basaltic nature of the ash does strongly suggest that the high explosivity for this eruption is being driven by interaction with water at the crater. UPDATE 4:15 PM (Eastern): A great gallery of images related to the eruption (h/t to Alex Witze). Top left: The eruptive plume from Grímsvötn, seen on May 21, 2011.